It was with some trepidation that I sat down to watch Terry Pratchett’s BBC 2 documentary (if you can call it that) ‘Choosing to Die’ last night on catch-up. Trepidation, because the deaths I have witnessed as a nurse, and sitting with both my mother and father as they died, are not about the ‘gentle closing of the eyes’ we see in films or read about in books. People tend to hover between life and death for a long time, often becoming increasingly restless or agitated. It can also be alarming, and sickening, to listen to laboured breathing caused by fluid gathering in the lungs, and get used to the distinctive and unpleasant acetone odour that pervades everything as the dying person’s system closes down. But this turned out to be the most extraordinary film I have ever seen. 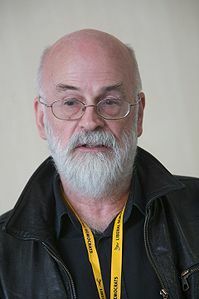 I was deeply moved by Terry Pratchett’s courageous odessey into assisted suicide, which culminated in him accompanying Peter Smedley and his wife to Dignitas’ little blue house on the industrial estate outside Zurich, where, at some point in the not too distant future, Terry will also choose to end his life. With his wife sitting beside him, stroking his hand as he swallowed the fatal concoction, Peter’s death was dignified, painless and quick. The alternative for him was to stay alive and die a dreadful lingering death that happens to those with motor-neurone-disease. It made me think about my father’s death. My father did not have a debilitating disease, but he suffered a stroke which destroyed part of his brain. The scan showed there was no hope of recover, and although he might survive the stroke, he would be in a vegetative state, needing 24-hour care for rest of his days. My father was fiercely independent, and had always said that if his quality of life was to become seriously impaired, he did not want to receive life-extending treatment. Since he was unable to communicate, it was down to me as his next-of-kin to inform the doctor of his wishes. Following this difficult conversation, he was put on an end of life care plan, which meant no further life-extending treatments, and allowing time to take its course. It took a further six days for him to die, during which time I was seriously tempted – more than once – to put a pillow over his face to stop this gruelling, distressing – and seemingly endless – dying process. How much kinder it would have been for him, and admittedly, for me, if doctor assisted death was legal in the UK. He really could have ‘slipped away’ quietly and peacefully with me, and perhaps other friends and family by his bedside. Instead I was left feeling angry and sad. All my memories of my father are clouded by these last few days of his life. And, it has made me determined not to put my own children through the same experience when my time comes. I want to end my life with the same dignity as Dignitas offers those who have made this ultimate choice. But I don’t want to be forced to fly to a foreign country I don’t know, or put the person who comes with me at risk of prosecution. The current law in the UK places an absolute ban on assisting another person to die. Assisting a suicide is an offence under the Suicide Act 1961, punishable with up to 14 years of imprisonment. During such an emotionally wrought time, this seems, to me, to be utterly heartless and inhumane. I realise that assisted suicide and doctor assisted death need rigorous regulation, but it really is time for the law to change. ‘Who owns a person’s life?’ mused Terry Pratchett in the film. True, we do not have the choice about whether or not we want to be born into this life. Yet, surely each one of us has the right to choose how we want to die. I believe this is a basic human right. One, similar to Terry Pratchett, that I am prepared to fight for. This entry was posted in All posts, End-of-life issues and tagged assisted suicide, end of life, end of life care plan, Terry Pratchett. Bookmark the permalink. Totally agree with you. I also found the programme fascinating. Poor Terry realised pretty quick though that he would have to make sure he went there while he still had all his faculties and could not leave it until he had lost them even though he might have made the arrangements “up front”. He would need to be “with it” right up to the end and be able to sign papers 2/3 minutes before the final drink – that hit home! Yes, I found the pressure of ‘timing’ distressing too. Yet, even though Peter Smedley may not have chosen to die at that point if assisted suicide or doctor-assisted suicide was legal in the UK, he was so clear about what he wanted. And, it was wonderful the way the Dignitas supporters kept asking him, ‘Are you sure you want to do this?’ However, Peter’s motor-neurone-disease is very different from Terry suffering from Alzheimer’s. If you are losing control over your mind, how DO you know when the time is right to take such a step? I would find it a very frightening predicament, and I thought this came across strongly in the film.